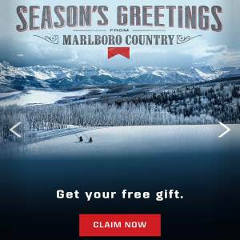 Login or register and click the ‘Claim Now’ button to get a FREE Gift from Marlboro. No purchase necessary. Limited to 1 item per eligible smoker 21 years of age or older on select mobile devices while supplies last through 1/18/18. Why do you still have the coupons on your packs if the free gift has expired ?